Like any other USCIS Form, this form too provides a way for applicants to provide additional information. So I have given two hypothetical examples and it shows you how to fill this section. You don't have to fill this section if there is nothing additional to report. In Part 1, other names used, our hypothetical candidate not only was known Fred, but occasionally also used the name Freddie. So the way to provide that information is that in item 3.a page number, we write down the page number on which 'other names used' topic appears. That would be page 2. We can also see that it is part 1 of the form so we write 1 in the corresponding box. And since we are dealing with his given name, which is item 14b, that is what we write in Item number. In 3d, you simply write down the additional piece of information. Let us take yet another example of providing additional information to the USCIS. Let us say that our example applicant also took three trips outside the US but there was space on page 3 for only two trips. 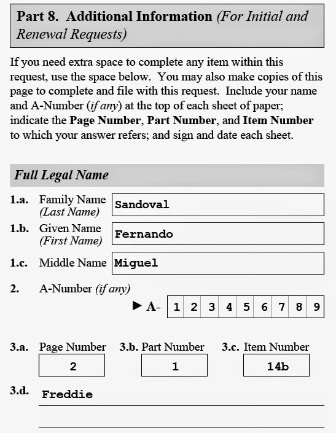 So we indicated the page number, and since we are dealing with part 2 of the form, we write 2 in box 4.b. The departure information is item number 7 and we write that down. In 4.d. we simply use the same format and provide the additional information.